Nestled in the scenic Wapiti Valley of northwestern Wyoming, Doc’s Cabin offers you the unique opportunity to both sight-see and experience nature surrounding Yellowstone. 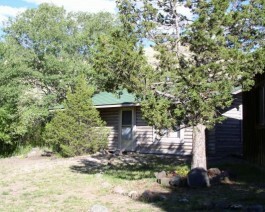 Come for a week of relaxation or use the cabin as a hub for recreation or visiting Yellowstone and Cody. The “cabin” actually consists of two cabins situated on 10 acres of stream and hillside. One cabin serves as the main living quarters and the other as a bunkhouse guest cabin. The main cabin is fully equipped with a 3/4 bath, a kitchen with wood burning stove, dining room table, two queen beds, and a small library. The bunkhouse guest cabin offers a large sitting area and sleeps up to six people (one queen, a bunk bed, and a roll-a-way). Open July-August. Pets welcome.